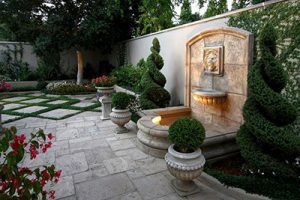 Concrete is one of the most resilient and versatile materials used in outdoor landscape design. It has become very popular over the years because of a large number of design and finishing options available with it. Concrete is also very easy to maintain and can last for decades with minimal care and maintenance. Unfortunately, no material is perfect and concrete will eventually lose its finish or crack after several years. At Ivy Studio, we can bring new life back to the surface of old concrete with sophisticated concrete resurfacing techniques and methods. Over the years, we have repaired many concrete driveways and patios, and brought them back to life in new and functional ways! This resurfacing technique is rarely used in outdoor applications because it’s thin and light. However, if you have a relatively sound concrete surface and just need to enhance its look, microtoppings work well. We can create texture and add color to the coating to add a little more brightness to the surface. This overlay is thicker and more durable, making it ideal for outdoor living spaces. We use it for patios, pool decks, walkways, and driveways regularly. The color and texture can be customized to suit your requirements so there’s room for some design flexibility. The spray-down systems create a skid-proof and resilient finish so you can place them around your pool and won’t have to worry about slipping on the wet surface. These coatings are quite thick and can be stamped to create a textured surface. You can add details like a natural stone or brick design to the surface if you don’t want a flat concrete-look. This is great for worn concrete that’s structurally sound because it completely levels the surface. We often add this to the surfaces that are required to be saw-cut or engraved. This concrete leveling overlay can also be customized with different colors, dyes, and stains. This treatment will prepare the surface for more overlays or coverings. We remove mold, weeds, and other such problems found in outdoor concrete installations through this method and ensure the surface is completely even and ready for other treatments. Ivy Studio has landscape design experts that provide comprehensive landscaping solutions to the greater Boston and Massachusetts Bay area. Get started on your landscape design project today to discuss concrete refinishing options, or take a look at the other landscape design services we offer if you would like to upgrade to patio or driveway pavers.